You may have seen our chic garb around town, worn by some of the most fashionable Austinites, especially during Bike Month in May. In honor of Bike Month, we're donating 100% of the May 2018 t-shirt proceeds to Bike Austin! USB 4GB Flash Drive with the Dynamic logo. Great for bringing in plan sets or taking home your scans! 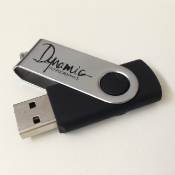 USB Drives are available for pickup at Dynamic. 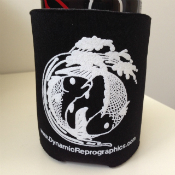 Get your own Dynamic koozie! Decorated with the infamous and classic Dynamic fish duo, you'll enjoy your drink more than ever. Koozies are available for pickup at Dynamic.